This month's Daring Bakers challenge is perfect for me. Ever since the weather turns cold, I have been wanting to horn my skill at bread baking. Of course I occasionally bake dinner rolls, but I am mostly grounded in my comfort zone. 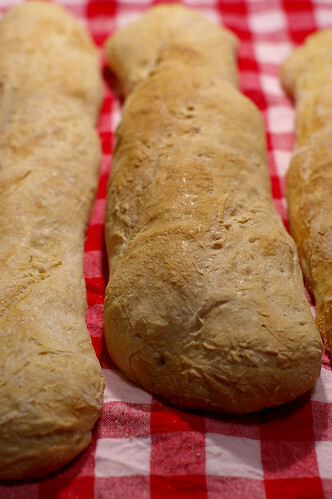 Making something like French Bread that takes 7-9 hours has certainly never crossed my mind. I am really glad that the past challenges have pushed me to bake some cool stuffs that my normal lazy self won't have attempted on my own. Our hostesses for this month- Sara of I Like to Cook and Mary of The Sour Dough have picked Julia Child's French Bread as this month challenge. It has been a challenge indeed from the very beginning. Even before I dip my measuring cup into the flour. Reading through the looooong recipe, had me feeling exhausted, before I get started. But once I got over the reading part, everything else was a breeze. Ok, maybe not as easy as I had envisioned, but hey, after two attempts, I got these batards you see here! Did I just mentioned I made this recipe twice? Oh yes, that's right. When I first made the recipe on Monday, my dough was unbelievably sticky and the little petits pains that I baked turned out looking anemic. Even though they tasted great, I was quite sure that something wasn't quite right, so I repeated the recipe again on Thursday. Learning from my first experience, I adhered to the recipe more closely, and shaped my dough into batards, like many of my fellow Daring Bakers do. Although there are many areas that my french bread can be improved on, I think it will be awhile before I bake french bread again. 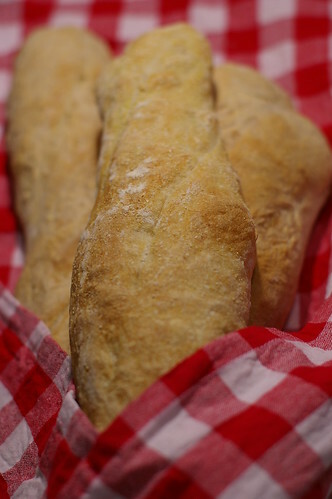 Don't get me wrong, I love this recipe, and the flavor of this bread is quite addictive. I can eat it without anything topping or spread. It's merely because I have 2 batches of these in the freezer now. 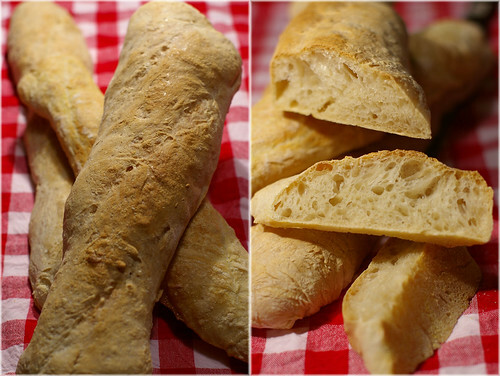 To read about the other Daring Bakers takes on the French Bread Challenge, head over to the Daring Bakers Blogroll. Mandy, your bread looks wonderful! Your perseverance definitely paid off! This is so cool! I still wonder how we can be punished ourself to go through those 15 pages of recipe! lol! Hi Mandy, I'm glad you decided to push through with it. Experience is priceless :) And it gave you nice loaves too! I love to dip it into a stew. Twice! There are a few of you out there who did this and I'm amazed. Looks fabulous! Fantastic bread. You did a great job!! 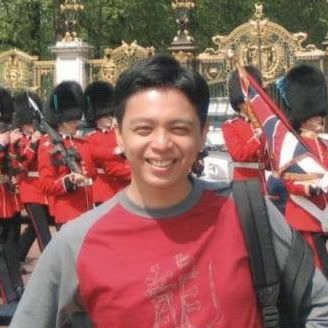 liked it very its blog, is the first time that I am visiting! Pretty bread, with butter and coffee is very good! Until more. oh mandy your french bread turned out beautifully!! great job for this month's challenge!! Isn't it great when you push yourself outside of your comfort zone! 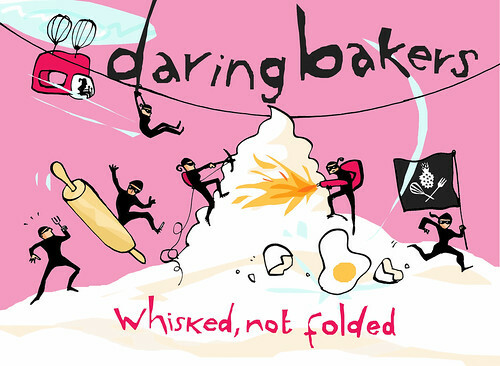 Congrats on your "daring baking" session(s)! Your bread looks great! Got to love how the Daring Bakers challenge us to go outside of our comfort zones! Well, they look great. Can having a freezer stuffed full of batards really be such a bad thing?! Very nice bread Mandy! The crumb looks perfect and I like the rustic shape of the loaves. Well done! Good for you for attempting it twice, that's more than I did! Your bread might be pale, but the crumb is what I like the most about it. It crumblicious! Good job of sticking with it! Oh Mandy your bread looks wonderful. I love the crumb on yours ...so perfect! Looks great! It's been fun to see what everyone has done with their loaves!! Fun challenge. I ate mine just straight with a little butter! Your bread looks absolutely wonderful! Good job on your bread. It looks terrific! I love the texture you got on the inside. I loved mine with bruschetta. And Nutella. And butter.....I loved it all! Gotta love french bread x 2! Wow your bread looks awesome! And I'm impressed you made it twice! I ate one bread with nutella, gave one away and ate the other one with just plain butter. Mine is all gone, so I may be making this again soon! Mandy, great looking loaves. Good for you for baking it again. I love your photos, once again! Gorgeous bread! I have some in the freezer too. Way to go making it twice! Your bread looks delicious - I love the Gallic towel that it's wrapped in! Hats off to your for doing this challenge more than once! One of these days, I'll be able to do that when I learn not to be a procrastinator! Your batards turned out very nicely -- the crumb is great! That looks great! I love the holes in the bread! I will definitely be trying Nutella on the last loaf in my freezer.... just sounds too amazing to pass up! You got great curst and crumb...job well done. I also found the reading exhausting! Your bread looks wonderful! Fantastic bread! Thanks for sharing with us. Hi Mandy! Great job, awesome pictures! This is beautiful. So nice and crusty. I bet the Nutella was great on it! Delicious! Can I have a slice? fyi: I tagged you in a meme. Lucky you to have tasty bread in your freezer. Mine is long gone. Your bread looks wonderful! Great Job! thanks everyone for your kind comments! you guys totally rock! These French breads sound interesting. I don't like breads much though. Authentic!